The venues are out of the ordinary, have lots of character, great ambiance, stunning sea views and are ideally suited for a wedding function. The Down to Earth venue, constructed out of clay, straw, wood and stained glass, has a rugged but stylish interior with yellow wood tables and Blackwood chairs. It has a sweeping view of green rolling grasslands with the blue Indian Ocean in the background.The Bush Lapa, set in an African rustic theme, provides traditional food cooked on an open fire. The open-air setting is unique; one can sit around the fire, gaze at the stars, or have a grandstand view of Mosselbay in the distance. 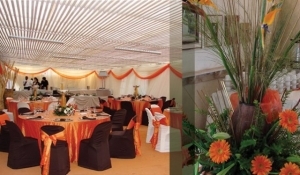 The Down To Earth Venue is the ideal setting for hosting a function of up to 100 guests. The venue is built with clay, straw, wood and stained glass gables. The interior is rugged but stylish with yellow wood6 –seater and 4-seater tables and an intimate dance floor. It has a sweeping view of the Indian Oceanwhich is framed by the silhouette of Mossel Bay in the background. 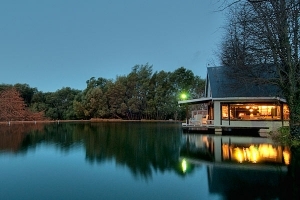 The spacious wooden deck can beused for the wedding ceremony and is ideally suited for spitbraai’s.The grass land in front of the restaurant is the perfect spot for a romantic marques tent and outdoor activities.Our 3 star graded guest house consists of 4 self-catering units and is situated 50m from the Down toEarth venue. It can accommodate up to thirteen guests.The Restaurant is well known for its affordable tasteful country cuisine like our famous red wine oxtail,rosemary leg of lamb, dried fruit stuffed pork roll, pumpkin fritters, home made breads and jams etc. 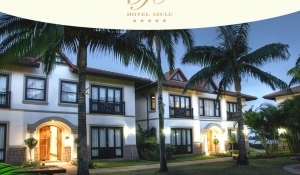 Hotel Izulu is a luxury five star boutique hotel located on the North Coast of KwaZulu Natal. It is the perfect place to enjoy the warmth of the Indian Ocean Hot features nineteen deluxe accommodates within a modern-day intermix of doric architecture, African characteristics and Balinese shapes. Contrasting types of architecture form a sociable mix, and are most often identified as "an African affection with an Asian spirit". Five deluxe detached villas are spread out in manicured grounds and each villa provides two Executive accommodates, two luxurious Suites, a secret courtyard and an 8-seater Jacuzzi. Deluxe living attests itself in the majestic cortege - the favorite option of dignitaries' and Hollywood celebrities. Extended across the full top floor of Villa Ingelosi, it covers a bar, dining arena, individualised deck and Jacuzzi, which by the way commands the Indian Ocean. The majestic cortege is perfect for honeymooners; as a matter of fact, bridal couples will get together lwith this 5 star boutique hotel! They may espouse in bliss in the hotel's chapel and then celebrate a la mode in the feasting hall. Summer is our rainy season and we often have thunderstorms in the afternoons. The days are hot but by nightfall it cools off. However please be prepared for the occasional cold snap. Our winters are generally mild and dry with warm days and chilly mornings and evenings – a wonderful time for visiting KwaZulu-Natal. This is a malaria free area The dress code at the lodge is casual. For the tours you will need comfortable walking shoes, a sun hat, sunblock, binoculars, sunglasses and a light jersey/jacket for the summer and in winter a warm jacket/fleece. A light rain/wind proof jacket is recommended. The bedrooms are equipped with all the modern conveniences with heated towel rails and 100% cotton percale linen adding to your comfort. These luxuries do not detract from the colonial design, but merely enhance your turn of the century South African colonial life experience. The beds are ¾ twins but doubles are available on request.Each of the six twin cottages has its own shower and bath from where one can soak up the atmosphere of Spioenkop whilst gazing out over the valley. Guest amenities consist of a unique range of exquisite hand-made virgin olive-based African Botanical body care products. They are 100% natural, botanically active, ph-balanced, cruelty free products with no harmful chemicals or parabens. Oaklands was founded in 1860 by Bob Hall, an English millionaire who acquired the property as a gift for his wife. Initially run as a game farm, Oaklands took its name from an Oak forest that was planted nearby to supply duiselbooms - the long poles that hitched oxen to their wagons. The property has since been owned and managed by a string of colourful characters including a clairvoyant who is said to have hosted séances on hotel's upper floors, and a South African provincial cricket captain. 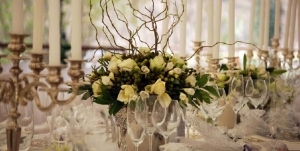 At Oaklands Country Manor in KwaZulu Natal we specialise in intimate country style weddings, each one personalised to create a uniquely magical day for the couple and their guests. The venue is exclusively reserved for the wedding party, ensuring that no effort is spared in coordinating the day the couple will always remember. We are tucked away in the most beautiful Kamberg valley in the Drakensberg Mountains near Giant's Castle (just below Highmoor Dam) in KwaZulu Natal approx. 4.5 hours from Johannesburg and 2 hours from Durban Passion and dedication are the keywords in the Cleopatra kitchen - his speciality is sauces, a subject very close to his heart. He has long been obsessed with reduction techniques - which allow the full intense flavour of the food to shine through.Fresh ingredients are essential, and being able to pick from the gardens minutes before serving is a real pleasure. For the most exotic tastes, Richard spends hours hunting down local and imported ingredients of the highest quality - flying in fresh salmon from Norway and procuring genuine Parma hams and cheeses from Italy. Horse riding is available 10 minutes drive down the road on the most beautiful Appaloosa horses. The rides are approximately 2½ hours in duration and they cater for novice and experienced riders. Your horse ride will take you over rolling hills with the spectacular mountain scenery and the horses are well suited to all types of terrain. For those whose taste runs more to thoroughbreds, Sue Armstrong does tours of the local race horse studs. Full and half day tours available. She does offer transport to and from Cleopatra. 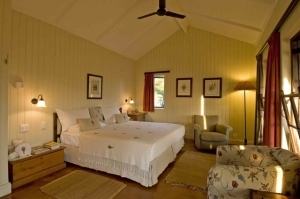 The Hotel and wedding venue is conveniently situated in Bothas Hill, 4km from the nearest business district and 65km from King Shaka International Airport, Chantecler offers all the amenities of city life without losing the tranquility and seclusion of the countryside, The Chantecler Hotel is the perfect luxury “Heaven on Earth” Country retreat. The beautiful stone and thatch chapel nestled between towering pine trees completes the picture. This stunning location combined with first rate service and excellent food makes Chantecler the ideal location for your wedding celebration.For such an auspicious occasion, The Chantecler Hotel pulls out all the stops, creating magical moments and ever-after memories filled with romance – everything you dream your wedding will be. For your dream day, we will tailor make a menu according to your personal preferences, providing sumptuous dining for your guests to match the unparalleled splendour of The Chantecler Hotel. Whether a breakfast, cocktail or dinner wedding, we will indulge your every need. Palm Dune Beach Lodge is a rare find wedding venue on the sought after Dolphin Coast of KwaZulu-Natal and is less than half an hours drive from the King Shaka International Airport en route to the rich diversity of Zululand’s Big Five game reserves and the St Lucia Wetland Park World Heritage Site. The rooms are all en suite and air conditioned and configured into one, two and three bedroom units. All the bedrooms have their own access and can be occupied individually or as a complete chalet. These chalets also have a self catering component with a fully fitted kitchen and separate lounge/dinning area. 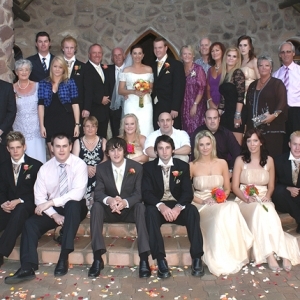 Palm Dune Beach Lodge is one of the premier wedding destinations on the North coast. Beach Weddings are our specialty and one look at our expansive beach the Lodge is on will convince you why. The ultimate romantic beach wedding venue of your dreams is attainable here. Whether it is outdoors or an indoor affair, Palm dune has a variety of options. Barefoot beach elegance is accompanied by fine dining and luxurious accommodation. To pamper the bride, Palm Dune has their own Spa, which offers massages and treatments in preparation for the big day. Complimenting this magnificent setting is a variety of menus to cater for every taste. Granny Mouse Country House & Spa is as quaint as its name implies. Old-world charm, embedded in the foundations of the hotel and wedding venue, complements the rural ambience and modern comforts. This elegant hotel with restaurants and spa is in the picturesque KwaZulu-Natal Midlands at the foothills of the uKhahlamba-Drakensberg, one of South Africa’s world heritage sites. Here we offer country hospitality and homely accommodation a few kilometres from the N3 highway.Dreams are made in the land of Zulu's and weddings are the stuff that dreams are made of. Whether your special day involves an intimate lunch for family and close friends or an opulent banquet for more of a social affair, Granny Mouse has the setting to turn your dreams into reality.At Granny Mouse the wedding package is designed to make this wonderful yet often stressful time as easy as possible, whilst ensuring that we attend to every detail requested by all the parties concerned. With our air conditioned chapel overlooking the Caversham Valley that can seat up to 150 guests, and the Caversham Room that can seat 120 guests if your wish is to dance the night away, or 150 guests if it is a quieter day - Granny Mouse Country House and Spa is the venue of choice. TALA Private Game Reserve is a wildlife conservancy hidden in the hills of a quiet farming community not far from Durban in KwaZulu-Natal. We are ever aware that as guardians of this precious piece of Africa we have a responsibility to pass this sanctuary on to future generations. TALA’s mix of acacia thornveld, open grassland and sensitive wetland provides exceptional game watching and birding, setting the stage for that perfect photograph. We have a number of superb venues and a service team committed to providing you with a unique experience. TALA is ideally located for conferences, weddings, celebrations or simply a short retreat to rejuvenate and relax. TALA allows you to get closer to nature, to really interact with the environment and animals, and to experience the sights, sounds and smells of the African bush. 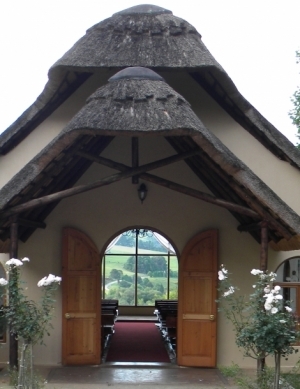 Leadwood is a fully exclusive five star lodge and an ideal location for an intimate wedding. Leadwood is an architectural masterpiece of African organic design that took three years to complete, a project which was personally overseen by Stuart Hilcove, Tala’s owner. The elegant main house is accompanied by six private cottages. It’s comfortable openness and stylish décor combines colour, mythology and furnishings full of rich South African history with an un- compromising approach to luxury and detail. A dedicated executive chef brings a wealth of boutique hotel experience to Leadwood and has a rare talent for merging the simple and the sublime. Enjoy the revitalising pool, breath taking views over a natural watering hole surrounded by a valley of Acacia’s, a world renowned wine cellar and a private library.